Over the holidays while grocery shopping I spied some quark, and decided I better buy it while the store had it. Exotic groceries are not as plentiful here in the winter. I like summer for many reasons, but one of them is that the deluge of tourists and cottagers to this area also brings better grocery shopping. Why quark? Well long ago in Bracebridge there was a really scrumptious German bakery. My favourite item at this bakery was the cheese danish. They were made with a quark filling, very tart and lemony. On top of the filling was streusel. The bakery closed many years ago, and I have never found such wonderful danish anywhere else. So, I though maybe I could make something like that. 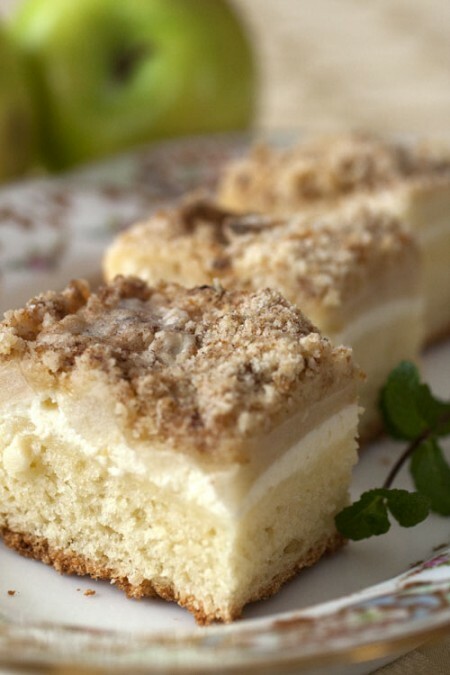 After searching around on the internet I found a recipe for a quark streusel cake on the About German cooking blog http://germanfood.about.com/od/baking/r/streuselkuchen.htm. So, I made the recipe, then had to adapt it by making the dough work with a lot more liquid, and adding apple to the layers. The taste of the quark layer was very similar to my memory from the bakery danish. The rest of the cake was quite good as well. Overall this is a make again cake. Although there are several steps, making the dough the night before using the Artisan Bread in Five Minutes a Day method of just mixing the dough and letting is sit worked well and is very easy. 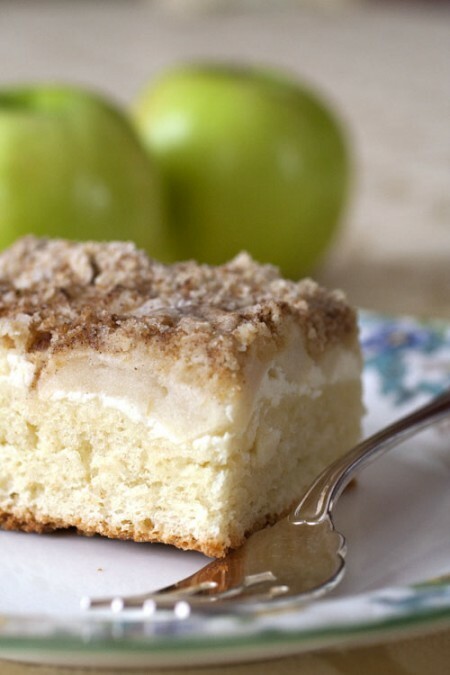 The is not very sweet, and even though I like cakes that are only a little sweet, I might add some brown sugar to the apple layer next time. A slice of this is great for breakfast when you cant stand cottage cheese one more day (I try to eat a high protein and nutritious breakfast, but occasionally I fall off the wagon and have something like this instead). Here is my adapted recipe. The quantities are pretty forgiving, so feel free to adapt or to use another fruit or no fruit at all, and enjoy the “quarky” goodness of the filling. Enough additional water to make a dough (around a ½ cup, but depends on your flour) Melt the butter in the milk. Add the yeast and proof this until the yeast develops a foam. Put the flour in a bowl with the rest of the ingredients, add the milk, egg, and mix until this turns into a soft dough. You will probably need to add a little water, depends on the size of the egg and your flour. The next day push the lump of dough into a greased pan, I used a pyrex pan just one size smaller than 9 x 13. You could also use a 10” springform pan. Let the dough rise until it is doubled again (about 1 hour). 2 Tbl cornstarch Mix this all together as for cheesecake. Spread over the dough. Peel, core, and slice about 4 apples. Granny Smith are good, needs to be a tart apple. Layer the slices over the quark filling so they overlap each other and completely cover the filling. Mix the incredients like pie dough so you have lumps of butter remaining. Spread this over the apples evenly. Bake at 350 for about an hour, watching that the crust gets slightly brown and the apples and streusel are cooked. This cake freezes well. This entry was posted on Sunday, January 9th, 2011 at 7:43 pm	and is filed under Interesting Ingedients, Recipes, baking. You can follow any responses to this entry through the RSS 2.0 feed. Both comments and pings are currently closed.